The swirling sand, dust devils, vortices are generated when a hot gas at low altitude quickly rises through a bag of another (or the same) cold gas. That is, when there are differences between high temperature and high layers lower layers. By raising the hot gas quickly it spreads in a tube rotating angle by the principle of conservation (basic physics) as the gas does not rise “straight” but zigzagging between the cold gas. Principle of conservation of mass, if you remove something has to be filled with something else, so, usually in the center of the whirlpool another tube because hot gas, the hot gas is being emptied is generated. That is, if the hot gas rises, the hole that is filled with more hot gas rising even faster making and helps a swirl is maintained (until it is able to generate more hot gas). Remember that hot gas rises, cools, falls, reheated and back up, so the eddies work until they are able to generate more hot gas that is the situation. And if you have fixed gas I said because this effect goes anywhere and with any kind of matter in any state. Eddies are also generated in a liquid and a solid (slower). An example we all know a swirl in a liquid is what happens in a pressure cooker with convection currents where it floats your food. Mars, in the picture, is a clear example of another planet where this happens. Although initially it was thought that it was not, the probes sent have captured images of these phenomena because the sun heats (much) the Martian soil, causing the gases (carbon dioxide, mainly) suffer the same effect as Earth sees. The only difference, on Mars, is the size of these eddies and often much higher than here (for now that climate change is warming more than the lower layers are becoming more common, such as hurricanes) reaching model the Martian soil. There are places, there are areas in which these elements have sculpted this floor as in the Amazonis Planitia. And, knowing that hurricanes are similar but larger phenomena, we must name the famous “eye” of Jupiter that has been with us for over 300 years. Whenever there is a difference between two high temperature appended layers there is a high possibility that this phenomenon is formed. Its size and virulence depends on the difference of temperature and pressure at that time. Obviously on every planet the situation is different but the principle that generates them is the same. Remember, physics is a universal language (like mathematics) since by the scientific method what happens in a place in the universe is going to happen anywhere in the same manner and under the same conditions. First, we usually get out from the pressure and typography. Hurricans motion is governed by the angular momentum (as I say before), so we begin with this. Let be u the eastward velocity of the hurricane relative to the Earth and v it’s northward velocity and φ the latitude and θ latitude’s and lonitude’s angles. Be r the Earth radius and Ω the angular velocity of the Earth’s rotation. 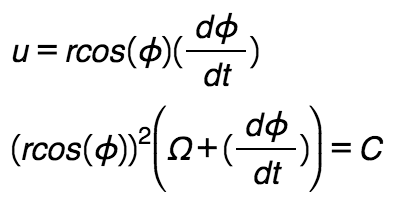 Witch is an easy diferential equation witch can be resolved to know the rate of dθ/dt. So in that way we can know how it will be change. Now we can take dθ/dt from the poleward acceleration due it’s forced precession with Earth’s rotation. Where v is the angular velocity and q is the wind velocity.